Ein Baby ist geboren! / A Baby is born. Until a Baby is born it takes a long time with patience, care and many thoughts. And then it is quite a reson for a party. Bis ein Baby geboren ist, braucht es eine lange Zeit mit Geduld, Sorgfalt und vielen Gedanken. Und dann ist es ein guter Grund für eine Feier. 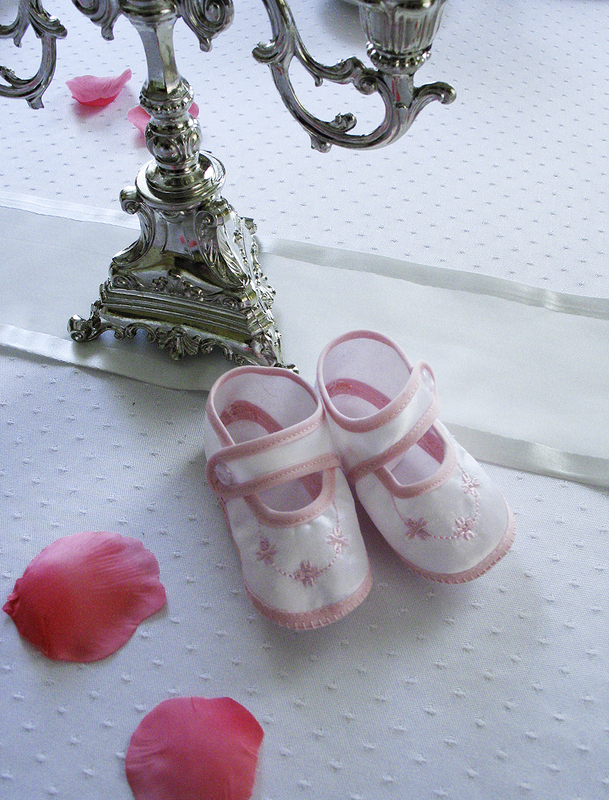 Schöne Tischdekorationen für Babyfeiern in Türkis, Blau oder Rosa gibt es ebenfalls bei www.Silber-und-Rosen-Shop.de. A Baby shower asks for special decoration. Pink for little girls is so cute. Eine Wilkommensfeier fürs Baby braucht eine besondere Dekoration. Pink ist für kleine Mädchen so süß. Roses and hearts have the right meaning. Rosen und Herzen haben die richtige Bedeutung. It needs not many efforts to make a nice party. Just the loving care of a mother. So have a tea with me to celebrate "My New Born Baby". Es braucht nicht viel, um eine Feier schön auszustatten. Nur die liebende Sorgfalt einer Mutter. Also trink einen Tee mit mir um "Mein neugeborenes Baby" zu feiern. Or would you rather have a glass of champain? No, I don't have literally a new born baby! I celebrate my Online-Shop, which started today. Oder möchtest du lieber ein Glas Sekt? Nein, das Neugeborenes ist nicht wörtlich zu nehmen. Ich feiere meinen Online-Shop, der heute freigeschaltet wurde. Sandi @ The Rose Chintz Cottage. Also zu diesem Anlass ziehe ich das Glas Sekt vor und möchte ganz ♥-lich mit dir auf deinen Shop anstossen! !, War eben gerade kurz dort. Jetzt Beine hoch und tief durchatmen... das war bestimmt eine Höllenarbeit. Gratulation! Da schau ich gleich rein. Let's toast to this new born Baby! Your own Silver & Roses Shop... a dream come true. As a warm welcome I have quickly created a clickable button for on my sidebar. As for the shipping to other countries than Germany, you ought to leave a line in your welcome, so people know. The ones that read here, know but not those that would go straight to your site. Wishing you oodles of luck and keep up your lovely passion! thank you for your visit and the kind comment. 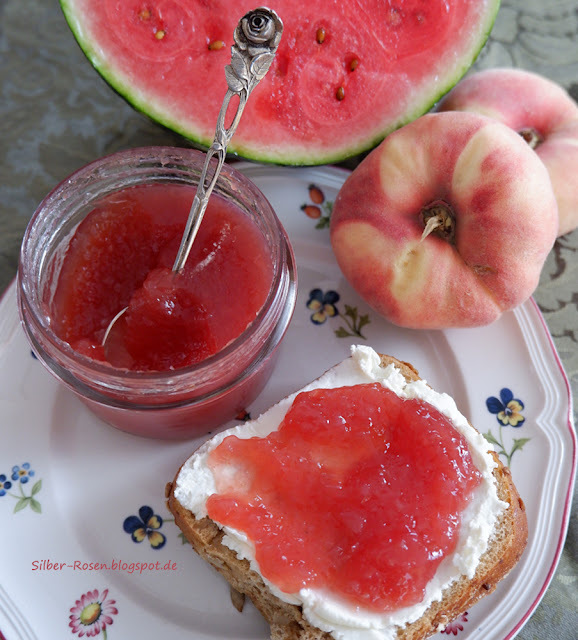 You will find the Shop with the button below my header or with the link www.silber-und-rosen-Shop. P.S: Zaa fragte, wie sie zum Shop kommt. 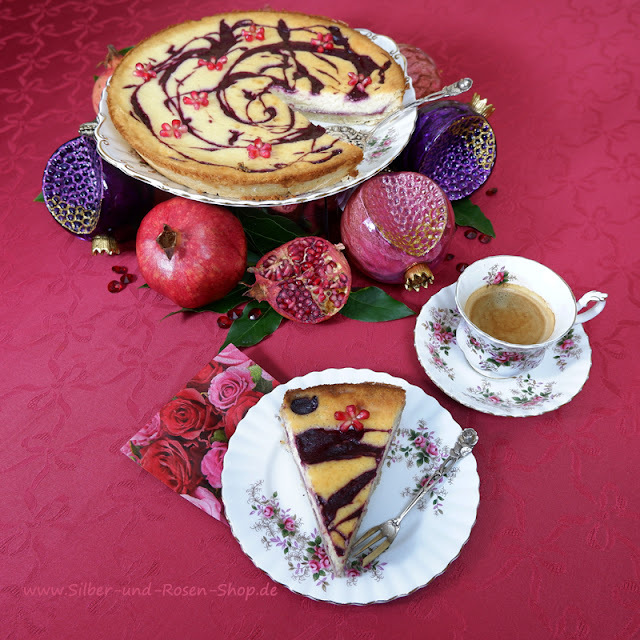 Entweder über die Auswahl unter dem Headerfoto oder über www.silber-und-rosen-shop.de. ich glaube ich hab Tomaten auf den Augen und bin umzugsgeschädigt, ich hab deinen Shop erst übers rumgoogeln gefunden. Ich bin blind, heul. Jedenfalls gratuliere ich dir von Herzen, ein toller Internetauftritt und tolle soooo schöne Sachen. Viel Erfolg damit. Congratulations on your new store, Johanna! How exciting for you! Your china is very pretty as are the rose petals and hearts on the table. Thank you for joining me today. I know you have been busy. Have a lovely week and I wish you much success. OOohhh gefeliciteerd!!! Met de geboorte van uw winkel. Een goede keuze heeft U gedaan. Daar drink ik graag een glaasje op!! A lovely post for your new baby website! So very pretty with the pink of a favorite teaset. So pretty! I wish you great success in your business venture! Oh Johanna! I knew you were busy doing something! A new shop...Yay! And what a lovely tea party to celebrate. I am so thrilled for you! I will have to pop by and see your grand opening. Oh Johanna, this is wonderful, congratulations!! I'll be off to have a look and I wish you much success. 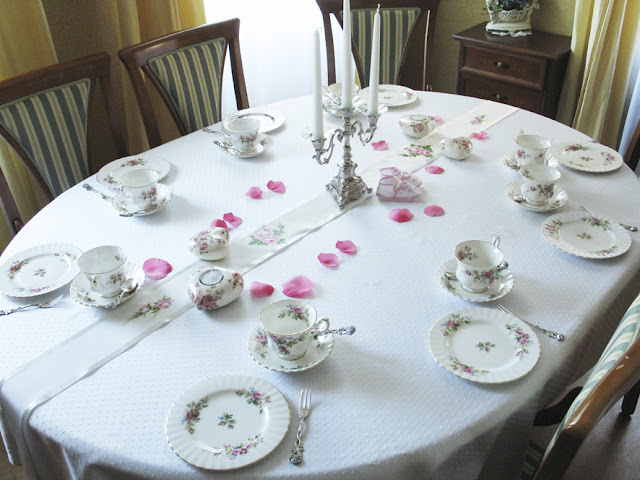 The tea table you set is perfect for the celebration. Oooh, an online shop. What an adventure! Congratulations, Johanna!! Best wishes to the start of your new on-line store. Cheers!!! Congratulations on your new online shop! That is such wonderful news. I hope it is a huge success for you and that you have lots of fun! Johanna....Your table is beautiful. I love the simplicity and your lovely china is so very pretty. Also the little rose petals add a nice touch and color and your runner with the pink roses accentuates it all. I'd love to be able and join you for tea. Its all so very charming!! Thankyou for coming to my blog.I was thrilled that you liked my spring birthday parties. It means so much to me that you came and posted a comment. That was so kind and thoughtful of you! I am now following you and hope to see more of your blog. Thanks again. How Exciting for you Johanna! Congratulations on your new adventure! I want to post it on my sidebar. Do you have a link??? 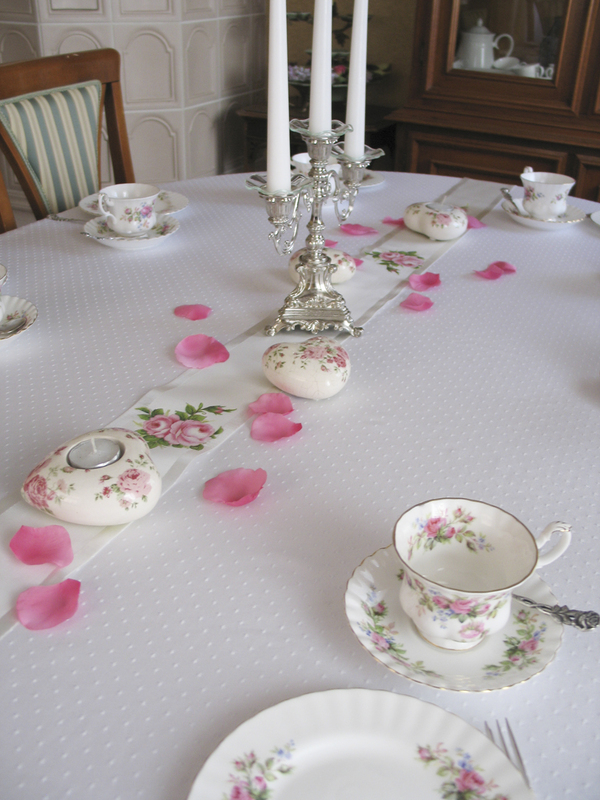 The tea table is set up so nice and I love the rose pedals thrown about. That beautiful runner is a plus! 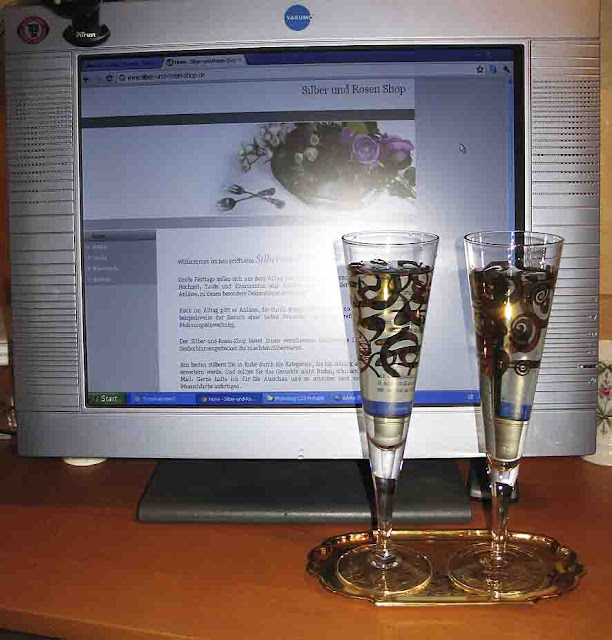 I had to laugh at the end when I found out that the celebration is to introduce your on-line store! LOL! You are so clever! You certainly got my attention. Congratulations on your new store! She's a beauty!! What a lovely table and I do love the rose petals. Pretty tea ware as well! And what a baby a new store is -- at least you don't have to change it!!! LOL! ich möchte dir ganz herzlich zu deinem neuen Online Shop . Allein schon der Name ist Vielversprechend, genau wie dein Blog. Heute Abend werde ich mit dir gemeinsam mit einem Gläschen Sekt drauf anstoßen. natürlich war ich gleich mal in Deinem kleinem Shop ! Herzlichen Glückwunsch ! Der Sekt steht schon kalt und heute Abend werde ich ein Gläschen au Dich trinken. Das wird spannend ! Congratulations on your shop, how exciting - I'll go visit! Your pink table is just adorable - of course I'll come any time (pink is my favourite colour!!). Hoping both you and Wiski are well. Good luck with the online shop, Johanna! You know - you had me fooled! Very beautiful! And contratulations on your new online shop. I will check it out. Congrats! I am so happy for you! I loved your post. 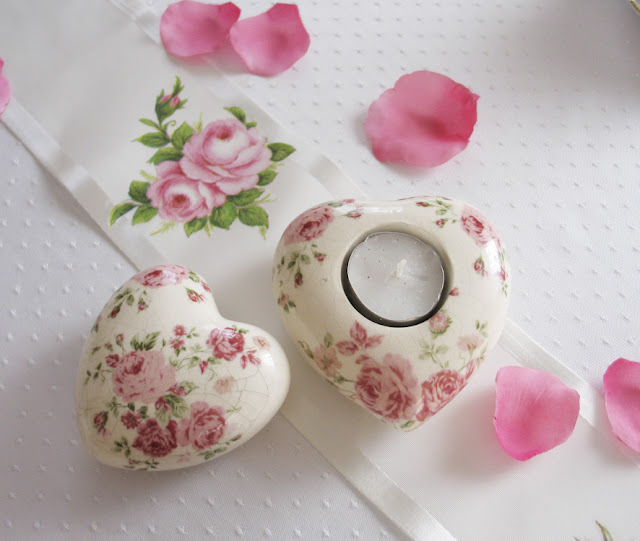 Yes, pink, hearts and roses were perfect to launch your new website! Lovely post. The pink is so soft and elegant. Prooooost, liebstige Johanna, alles gute zum "Baby"!!! Möge es auf das Prachtvollste gedeihen!!! Ich wünsche Dir alles Gute zu Deiner Shoperöffnung. Eine sehr gute Idee, so viele schöne Sachen der Welt nicht vorzuenthalten. 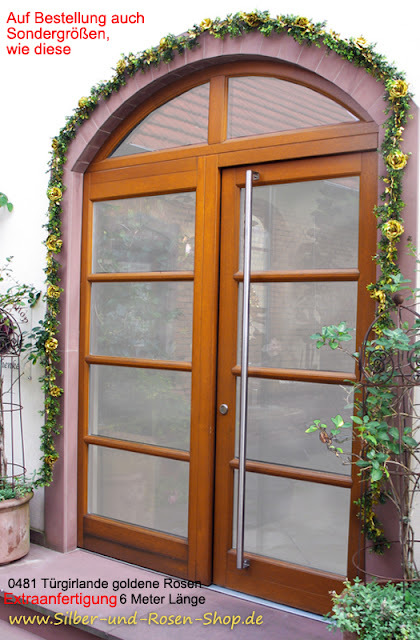 Deine rosa Dekoration ist so romantisch, gerade richtig für Dein neues Baby. Herzlichen Glückwunsch ! Ich wusste garnicht dass man "Baby Showers" jetzt auch in Deutschland feiert, zumindest haben die Kinder meiner Freundin sowas nie gemacht und ich habe das Wort zum ersten Mal vor 2 Jahren von einer Australierin gehört ! Wünsche Dir viel Erfolg mit Deinem Shop ! Oh, what a grand occasion! Yes, a glass of champagne, please! I wish you much success with your new baby! Thanks for sharing with us. besucht. das hast du ja ganz toll gemacht! und sie bildlich schön darzustellen.